If you use a custom set of Salesforce Task types, you can map these to your Jiminny activity types. When your team then log tasks through Jiminny, they will be saved correctly and feed into any reporting or existing processes. If you use Events instead of Tasks, a similar process applies (just substitute task for event in the instructions). Within Salesforce, Administrators must first enable Field Level Security for Type fields to allow updates and changes to be reflected in both Salesforce and Jiminny. Follow the instructions below to make sure this is enabled. Now Salesforce is configured, you just need to tell Jiminny which fields map together. 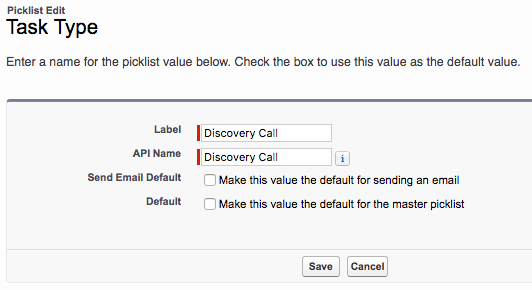 For the mapping to work, the activity type in Jiminny must be named exactly the same as the API Name in Salesforce. Remember, if the mapped fields are later renamed in either Jiminny or Salesforce and not reflected in both, the task logging will fail!